It’s weird, shivering here on a gloomy Melbourne day, to think Marmalade will be padding through all the summery states of the US. From an early breakfast of chocolate croissants with the wonderful publisher Poppy Grijalbo, the seed of an idea grew and grew until Marmalade emerged with a loud meow. Aww thank you, Dimity. Marmalade always purrs when we hear from you! Thank you, Kaye. 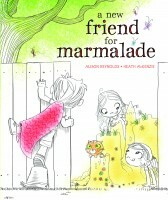 I’ve always loved S & S and love them even more now they’re publishing Marmalade! Thanks, Chris! It is weird to think that children all over the world are meeting that little marmalade cat.